The CLAS Electronic Reappointment Promotion and Tenure (eRPT) is a platform developed for managing the documents and workflow related to faculty reappointment, promotion and tenure with the College of Liberal Arts & Sciences. Below is a screencast that provides an overview of the eRPT’s functionality. The CLAS Electronic Reappointment Promotion and Tenure (eRPT) is a platform designed to manage documents related to the RPT process, with functionality that allows both applicants and reviewers to securely upload and view RPT documents. The platform automatically saves portfolios after each change. Department chair creates a portfolio for each applicant, which will be accessible to applicants for Stage 2. Applicants add the appropriate documents to their portfolio. Once they have finished, they indicate this on the site by clicking on the “Please click here when you are finished uploading and/or reviewing documents.” link which will send their portfolio to Stage 3, for review by the Department Review Committee (DRC). Department Review Committee members will see a list of all the completed applicants’ portfolios and will be able to view all the documents in each applicant’s portfolio. When they have completed their review of the documents in each portfolio, they indicate this on the site by clicking on the “Please click here when you are finished uploading and/or reviewing documents.” link which will send each portfolio to Stage 4, for review by the department chair. The department chair can then review the documents in each portfolio and also, if necessary, add additional documents to each portfolio. Once they have finished, they can indicate this on the site by clicking on the “Please click here when you are finished uploading and/or reviewing documents.” link which will sent each portfolio to Stage 5 for review by the College Review Committee (CRC). The College Review Committee members receive each portfolio once all other reviewers, including the department chair, have indicated that they are finished reviewing all the portfolio documents. It may take a few moments for the server to check your password. If your login is successful, you will be taken to the Your Groups screen. The Your Groups page displays a list of all the groups you are a member of. Most applicants will only have a home group. Review committee members will also belong to a Department Review Committee group (DRC) and/or the College Review Committee group (CRC). Click Review Portfolios to view a given applicant’s portfolio. The Group Portfolio page displays a list of portfolios that are currently in your group. Most applicants will only have one but reviewers may be able to see many at a time. Click the Review Documents link to view a list of documents. Applicants and reviewers can read all documents that are listed in a portfolio. Applicants and some reviewers can also add additional documents. Click the Finish Reviewing link to indicate that you are ready to send the portfolio to the next stage. Once all reviewers have clicked the Finish Reviewing link the portfolio will automatically move to the next stage where the next group will have access to it and the current group will no longer be able to access it. In the example above Dale Pike was added to the home group of Alexander Marciniak so Dale could help Alexander create his portfolio. If you are going to have someone else from your department (other than the chair) assist you please contact us so we can add them to your home group. The title of the portfolio. The name of the next group the portfolio will be sent to. In most cases it will be a DRC. Reorder documents by means of the two leftmost icons. Dragging a “paper” icon over the “green arrows” icon in the row where you want to move the document will move it to that location. View documents by clicking on the “paper with magnifier” icon. Delete documents by clicking on the “red circle” icon. Below the list of documents is a simple form for uploading documents. Click on the File Type drop-down menu to choose the file type that best describes the document you are uploading. 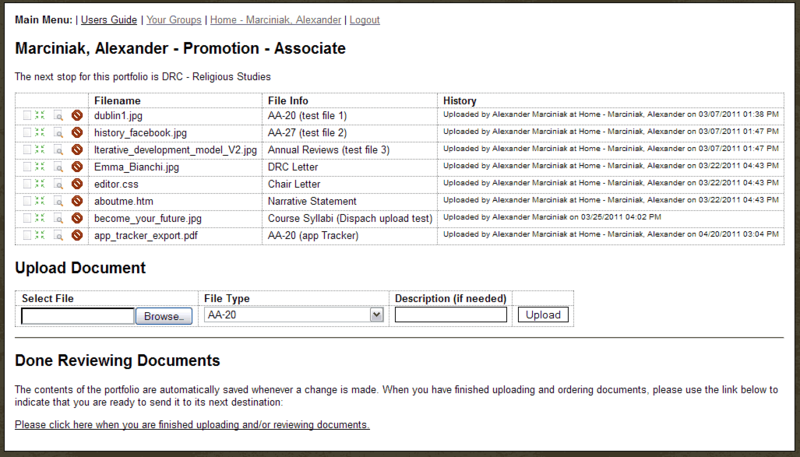 Newly uploaded documents are automatically placed at the end of the list. When you are done uploading and/or reviewing documents, click on the “Please click here when you are finished uploading and/or reviewing documents.” link at the bottom of the page. Note: This link has the same effect as the “Finished Reviewing” link on the “Group Portfolios” page. Also note that not all users have access to every option, some reviewers may only be able to view documents and will not be able to upload documents.